safety standards and always having the proper perimeter guarding in place. Do I Need Machine Guarding? My workplace has exposed machinery with moving parts. I don’t know if I’m compliant and up-to-date with industry regulations. I’m unprepared to pay regulatory fines if required. I cannot afford to shut down a production line if ordered to do so. I want to prevent workplace injuries. I cannot afford a costly lawsuit. If any of these describe your workplace environment, Velox can help you get up to code and provide critical protection for your employees and machines. Improper machine guarding is one of the most frequent causes of OSHA citations. It is your responsibility to provide a safe work environment. Failure to do so can result in hefty penalties, lost production, increased insurance premiums or, worst of all, serious personal injury. The first step to avoiding potential safety citations and violations is knowing what perimeter safety fencing you need for your space. 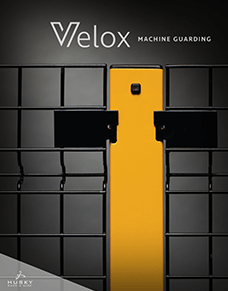 Velox’s modular design creates safety enclosures that comply with today’s safety standards as outlined by OSHA, ISO, European Norm (EN), ANSI, Robotic Industry Association (RIA) and Canadian Standards Association (CSA).